Social Family ride of approximately 9 miles. This ride is planned for for young riders and their parents/guardians. There will be experienced riders on hand to support and deal with any mechanical problems.We will take the ride nice and slowly and stop regularly to ensure everyone is happy. Please meet at Old Mill Hall Grove at 10.15am to allow time to collect consent forms and check safety. We will leave via Brereton Drive, head out to Denchworth visiting Lyford and Charney Bassett before returning to Grove. A beautiful morning for a leisurely cycle around Denchworth, Lyford and Charney Basset. We were joined by two new riders Tom Craig and his Daughter Isla who was just 8 years of age. As this was a first ride out on roads for Isla she did exceptionally well and the 9.5 mile route was completed in just over on hour and a quarter. Points of interest, Ride Kite, Lambs, and a woodpecker! We were blessed with sunshine and not too much wind which was just perfect. 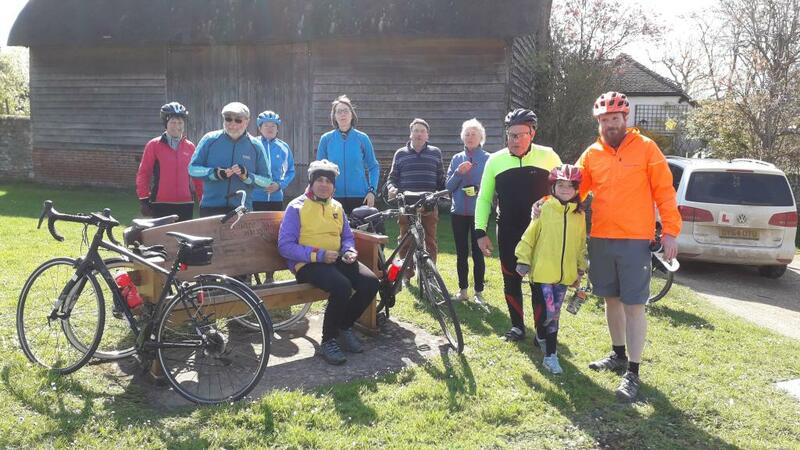 After a brief stop for Easter eggs at Charney Bassett village green we were blown to the Cafe in Grove for a well deserved coffee and cake stop! Some of our regular riders split at Charney for a slightly longer ride with a stop off at Stanford for coffee. Thanks to all riders for their support and encouragement for our newcomers.